Mira, Royal Detective features the voices of familiar names such as Freida Pinto, Kal Penn, Aasif Mandvi and Sarita Choudhury. Nakul Dev Mahajan was asked to be the official Bollywood choreographer for the series. Mahajan got to create fun routines to the show’s catchy music and see his choreography come to life in the animations. Produced by Wild Canary in association with Disney Junior, Mira, Royal Detective is executively produced by Sascha Paladino. 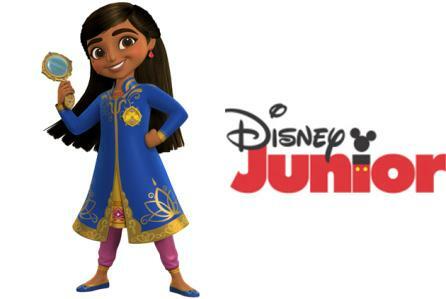 This will be Disney’s first series inspired by the cultures and customs of India. The show follows Mira (newcomer Leela Ladnier), a brave and resourceful commoner, who is appointed to the role of royal detective after solving a mystery that involves saving the kingdom’s young prince. She travels the magical Indian-inspired kingdom of Jalpur helping royals and commoners alike and will stop at nothing to solve a case. Her sidekicks include her friend Prince Neel, a talented inventor, her creative cousin Priya, and comical mongoose buddies Mikku and Chikku.